Surface conditions can influence the color and appearance of objects. A blue glossy object will appear more saturated while a similar object with irregular surface will appear duller. Human perceive colors by the light that is reflected off an object and different surface condition reflects light differently. There are two ways how light reflects off an object and they are referred to as specular reflection and diffuse reflection. Specular reflection happens when light reflects at the equal but opposite angle from the light source, Similar to how a ball bounces on a wall and return. 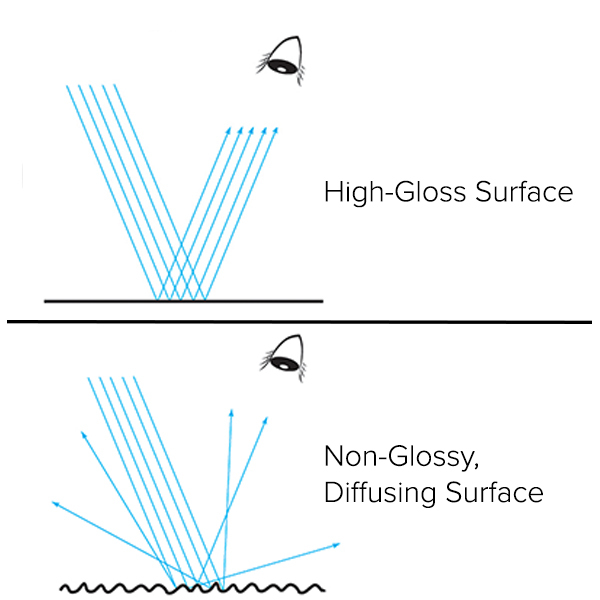 This reflection occurs strongly on objects with glossy smooth surfaces. When the reflected light is scattered in many directions, it is called diffuse reflection and this reflection occurs strongly on objects with matt or irregular surface. To measure an object true color, without the influence of surface conditions, the use of Specular Component Included (SCI) measurement mode is preferred. SCI mode includes both the specular and diffused reflected light, and is ideal for computer color matching and monitoring color quality. Specular Component Excluded (SCE) measurement mode, which excludes specular reflected light, is used to evaluate color of an object which correlates to visual perception. Using SCE mode, a glossy surface will typically measure darker than a matt surface of the same color; similar to how our eyes see it. This mode is typically used during quality control evaluations to ensure color matches the color standards by visual inspection. Download our free educational booklet to learn more about color science. Contact us for a free consultation with our color specialists on how to select the right measurement mode for your application needs.